You are at:Home»News»Hooray! Hikers Welcome! You love hiking. Why not try a supported hike at the Bobcat Trail Half Marathon or Bigfoot 10 Miler? You’ll be surrounded by fellow outdoor enthusiasts — both runners and hikers — enjoying some of the most beautiful trails offered by Ohio’s state parks. generous cutoff times allow you to enjoy the crisp fall air and gorgeous scenery — at your pace! 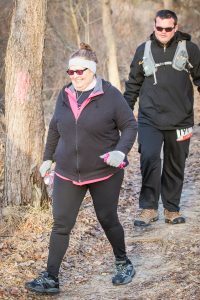 The Bobcat Half Marathon is a 13.1-mile point to point, with rolling hills and creek crossings on the hiking and bridle trails, as well as parts of the Buckeye Trail, all within Burr Oak State Park. Participants receive a car sticker, long sleeve tech tee, and a finisher’s medal. Jackie O’s Brewery will host a party in the Lodge afterward, where you’ll swap stories with fellow Bobcats. The Bigfoot 10 Miler is a permanently marked challenging loop course on the rolling hills of Salt Fork State Park. You’ll take home a Bigfoot sticker, another sweet swag item, a finisher’s medal, and epic stories of your accomplishment! We’ve reserved lodging at both locations — perfect for an Ohio fall getaway! Check out the race websites for reservation details. Both Bobcat and Bigfoot promise a wild time. Bring a friend, or just show up and make new ones!